The term clickbait is most broadly used to describe (and denigrate) a particular tone of sensationalist headline writing. This style was perfected by advertisers and content creators as tools for tracking click-throughs became widely available and used— multiple headline links can now be tested, and the number of clicks generated by each specific headline measured. This process, referred to as "A/B" testing, helped create some common tropes in headline writing that are now used across platforms– the style has moved beyond its origins on sites like Buzzfeed and UpWorthy to be used on social media by respected news organizations like the New York Times and NPR. When the Onion creates an entire site to parody it, you know it's made it! Clickbait has also become a visual phenomenon, which this site seeks to classify, analyze, and celebrate. This form of clickbait is comprised of an image and headline, typically styled to look like they could be recommended stories from the website hosting it. Both the images and the headlines are carefully optimized to be highly psychologically effective–sometimes to the point that the two barely relate to each other. The collection, drawn from my own extensive internet travels, can be sorted by "Design Principles" which have explanations relating the clickbait content to gestalt and psychological theory, or by my own subjective descriptors, accessible by clicking "Filters" in the sidebar. Because these examples are the ones that were targeted towards me and chosen as my personal ...favorites(?) it is a narrow band of the clickbait spectrum. While both clickbait and traditional web ads have the same goal of convincing users to click through to an advertiser's page, they pursue these clicks in different ways. An effective traditional ad needs to be visually appealing and well targeted. This screenshot was taken shortly before taxes were due after I had recently visited several tax-prep sites. These high-end ads are typically given prime placement and plenty of separation from the content to help them stand out. Google Adsense and AdWords help marketers precisely target users, and allow for innovative dynamic ads that relate directly to users' previous browser activity. Clickbait, conversely, does its best to gain legitimacy by masquerading as non-paid content. The gestalt principle of similarity states that things that look similar are percieved to be related. 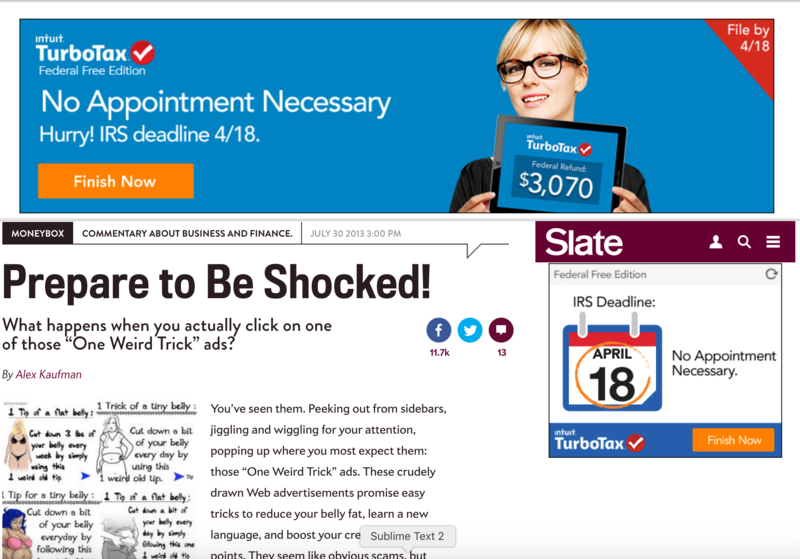 Clickbait does its best to blend in with a site's look and feel, mimicking its typography, color palette, and background color. You'll notice that despite my collection being tightly stacked and laid out in columns of equal width, some examples stand out due to their highly styled frames. However, the collection also blends into a cohesive whole due to another principle, that of proximity. Proximity is the idea that things placed near each other are percieved to be related. Notice that the "real" ads illustrated above have a large area of white space around them, separating them from the content. Clickbait is instead placed close to the end of the article, giving a reader the impression that it may be additional related content. Sometimes the clickbait is targeted–note that the article above is about clickbait, and the clickbait is also about internet marketing. The clickbait is also set into the grid of the site. 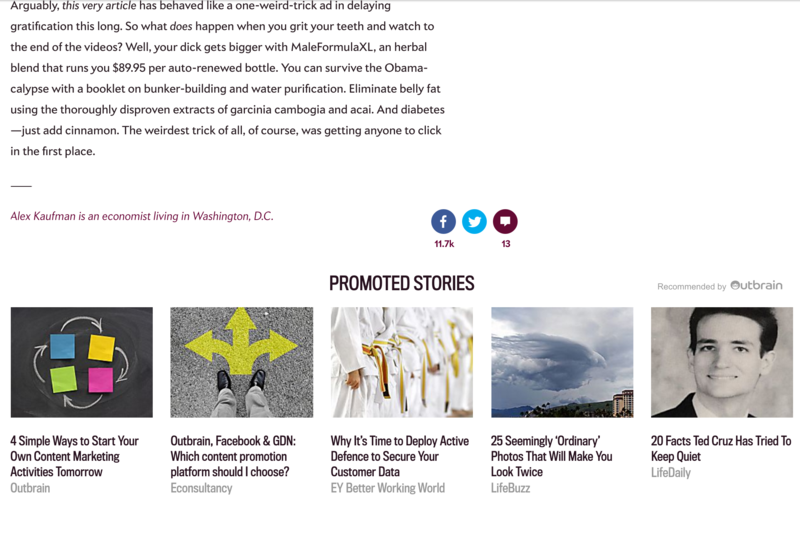 While Slate has designed their side to have a sidebar that is clear for traditional ads, they place the clickbait directly into the flow of the article, with the same column width. This is the principle of uniform connectedness, with common visual attributes like the page grid making the article and the clickbait seem related. 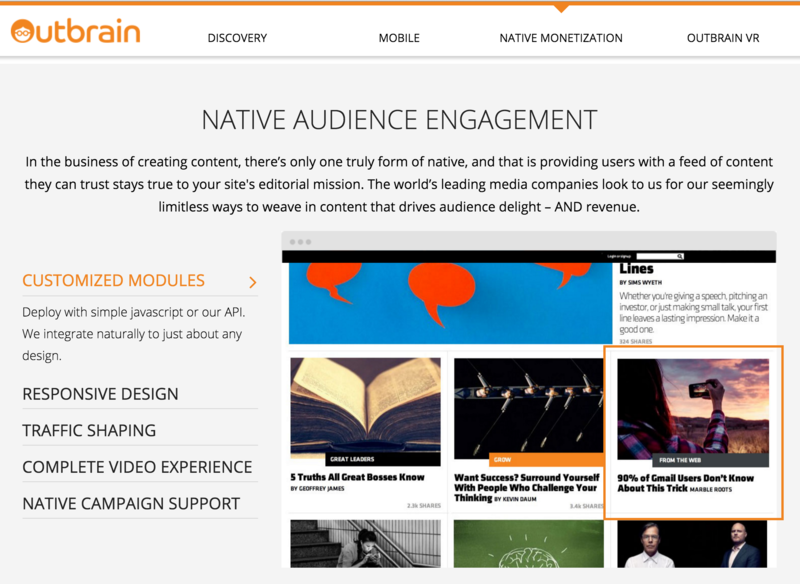 Outbrain, one of the most popular providers of clickbait-style advertising, promotes this sense of likeness as a benefit to potential hosts, allowing the ads to feel "seamless" in their layout. Of course, this setup also benefits the advertisers. I am unlikely to click on an ad while I am killing time reading articles, especially the ones for the generally more low-brow topics that clickbait excels at. I'd like to think that celebrity gossip is beneath me, but if I think a link is "culture" coverage from Slate, I might check it out.